2. It’s difficult to identify when to add those features. A roadmap comes handy. A good roadmap should give a clear answer to those 2 problems. Problem 1: When to add a feature? If you think about it, the whole concept of roadmap is against the lean principles. Adding a roadmap means planning the future in a mid-long term view. The Lean Analytics Stages Model by Alistair Croll and Ben Yoskovitz outlined in Lean Analytics allows you to identify in which phase of your startup you are. Based on this, you will know what is your main objective that you have to achieve in this phase. And plan features accordingly. Problem 2: What feature to add? Software is an amazing thing. What you can create with software nowadays is almost limitless. But you have to add features by following some kind of objectives. Some practitioners say you just have to follow purely expected revenue, but the Lean Analytics Stages disagrees with this concept. And so do I. 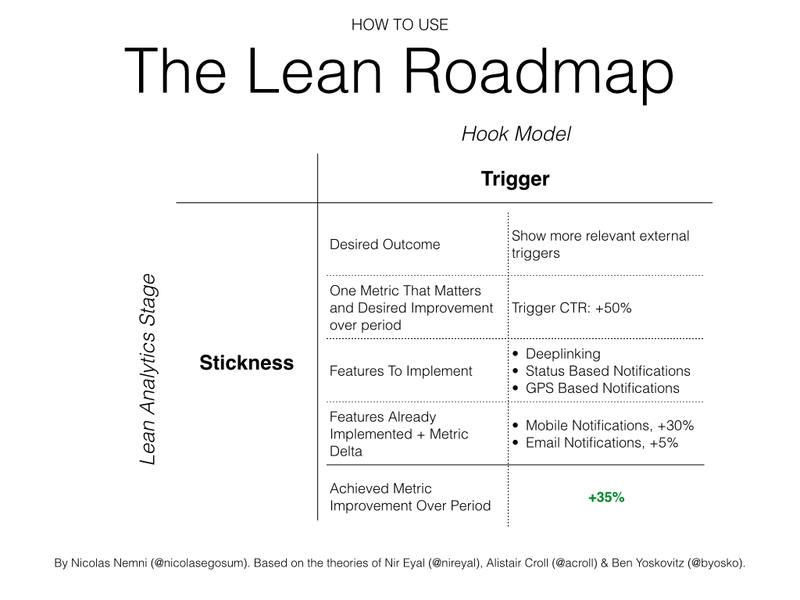 For this Lean Roadmap Model, I’m going to use the Hooked Model outlined in Hooked by Nir Eyal. The Hook Model divides features into 4 different areas, with the objective to be the natural solution to a problem in the user’s mind. Really disruptive products should aim at this. This is why I chose this model. By trying to solve both problems, reorganize your features on a canvas that takes care of both of them. The Lean Roadmap Canvas. Both goals will make all your efforts very focused. Plus, they will allow you not to waste time on features that are not required in the startup phase you are going through right now. When you have achieved your desired goal, you can pass to the next box. Here is where the “lean” comes in. Each box is very focused, but still not planned. Based on the results of continuous experiments you will perform with new features, you will change everything on the map. This will allow you both to be lean AND to have a mid-long term view of your product. 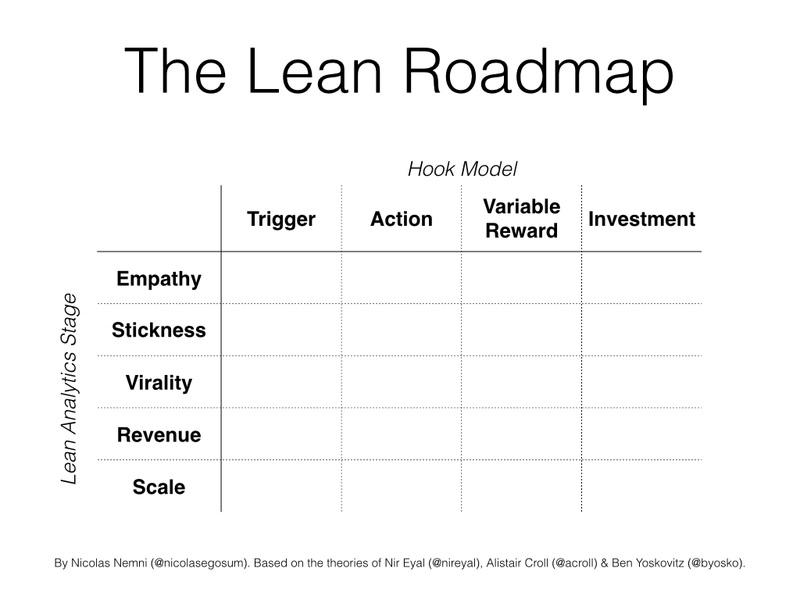 Hooked by Nir Eyal. You can find my summary here. Lean Analytics by Alistair Croll and Ben Yoskovitz. b) I wanna thank the author of those two books. I think that they are revolutionizing not only the startup movement, but also slowly the whole corporate environment. c) Cover pic from Harry Potter.